I Survived the Last Week of School | Who Are You Calling Crafty? Last week was the last week of First Grade for my daughter and we had our first Tropical Storm of the season, which equals a crazy busy week. 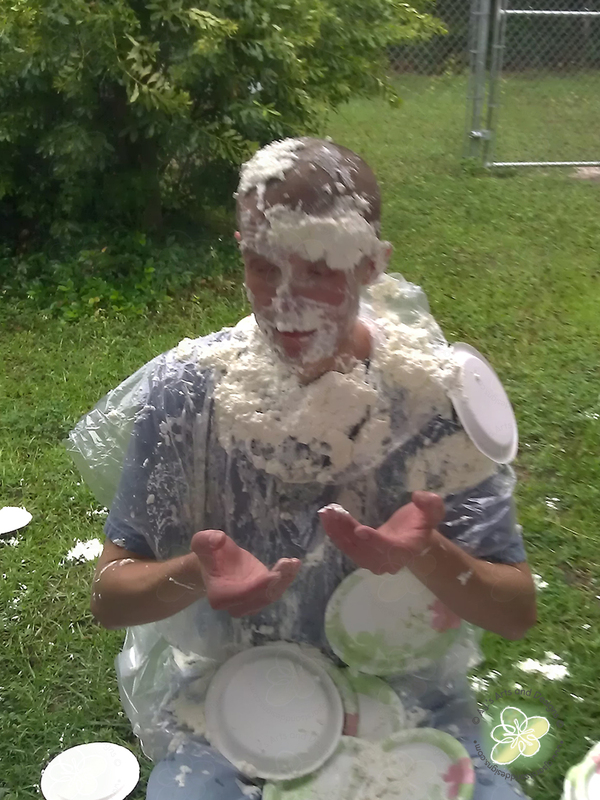 Jeff is such a great sport he let 22 first graders (and some adults) throw Whipped Cream Pies at him. HUGE HIT! Teacher’s Gift – this year it was a Terra Cotta Pot with the school logo and the kids finger prints as the rays of light from the lighthouse. Due to the Tropical Storm the flowers were not from the garden, we made flower pens instead of real flowers. We went to a School’s Out Party and they had a giant inflatable water slide. I also opened a Society 6 shop to order prints of some of my paintings and drawings – check it out here. The Rusty Blue Car is almost finished and I have started on a much smaller drawing – pictures coming soon.